Eva Sippl is a licensed natural health practitioner (“Heilpraktiker”, licensed in Germany), a polarity therapist, and reiki master. Eva made kombucha for years at home for her own enjoyment. She discovered on a visit to her home country in 2007 that kombuchas made in Germany are also brewed with herbal teas. This inspired Eva to combine her passion for kombucha with her knowledge of herbal healing properties. After conducting extensive research on the herbal approach to kombucha brewing, Eva then decided to add some green tea to the herbal brew to ensure the culture’s health. She started to create different recipes in her kitchen and gave them to her friends to try. 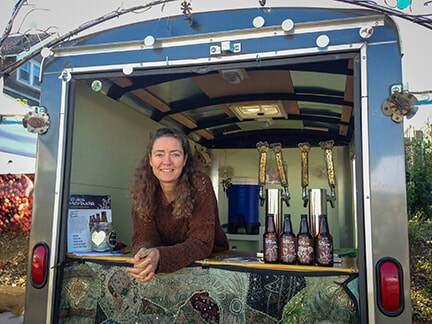 People loved them and were so excited about the idea of integrating herbal teas into the kombucha brew that Eva decided to rent a brewing facility in Portland, Oregon and bring them into stores to sell. Eva shows her commitment to support the health of the planet and the people populating it by using only the finest organic and wild harvested ingredients. Pacific Botanicals, and Frontier Coop, the suppliers for all the herbs and teas used in her products, have been a long-time leader in sustainable and responsible sourcing. The sugar used in the brewing process is 100% certified organic and fair trade. Eva’s Herbucha has been growing steadily and more and more stores are stocking their shelves with her 6 amazing flavors. Eva’s Herbucha combines naturally occurring healing properties found in kombucha with the wonderful flavors and healing effects of organic herbal, green, and black teas. We use only the finest organic and wild-harvest ingredients to craft our distinctive and delicious beverages. Herbucha is rich in antioxidants and probiotic acids, offering a powerful energy boost. It is said to detoxify and cleanse the blood of disease causing toxins. This may alleviate or even completely heal disorders like intestinal problems, digestive disorders, arthritis pains and kidney stones. With the added elements of Herbucha’s herbal ingredients, each product offers distinct health benefits. Whether you are looking to get a jumpstart, relieve anxiety, detoxify the body, bounce back from a hangover, or simply relax and support your overall immune system, Eva’s Herbucha delivers a clean, crisp flavor that feels and tastes good going down. If you are looking for our organic candy made from kombucha, please go to Eva's Cultured Candy. ​Kombucha is a fermented tea dating back several thousand years in Asia. The tea fungus originated in China in 220 BCE during the Tsin Dynasty and was referred to as as the ‘Divine Che’ (or the Remedy of Immortality). From there it traveled to Russia and Japan and made its way to Europe around the turn of the century. It became quite popular across Europe until World War II with the shortage of tea and sugar it disappeared, but has since made a comeback and has recently become quite popular in the western world. The name is said to originate from Doctor Kombu, who brought the tea fungus to Japan from Korea to cure the digestive troubles of the Emperor in the year 414. Kombucha is rich in antioxidants, probiotics, and detoxifying acids, offering a powerful energy boost. It is said to cleanse the blood of disease causing toxins. This may alleviate or even heal disorders such as intestinal problems, digestive disorders, arthritis pains and kidney stones. We create products that benefit people while supporting our planet through carefully selected local and global business practices and partnerships. Our company’s philosophy is to treat Mother Earth gently and with respect. For example, we use only recycled paper for our office and advertising materials, 98% of our packaging materials are produced in Portland, OR and our bottles are made of recycled glass. As a member of 1% for the Planet we contribute one percent of our annual sales directly to Oregon Environmental Council, Oceans Initiative , Rozalia Project and Big Life Foundation - four approved nonprofit environmental organizations in the network of 1% for the Planet. Nonprofits are approved based on referrals, track record and environmental focus. Thousands of nonprofits worldwide are currently approved.